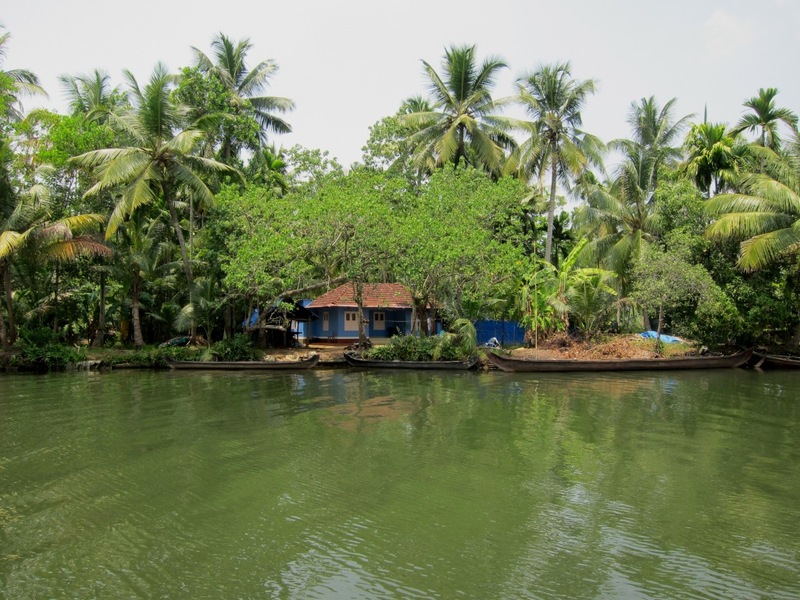 I seem to be in the minority, as most people I’ve met told me that Kochi (formerly Cochin) was only worth a day or two, but I personally found it to be one of the nicest cities that I have visited in India. Filled with trees, parks, and historic buildings, it was incredibly photogenic, and this blog post will be a bit overloaded with photos as a result. 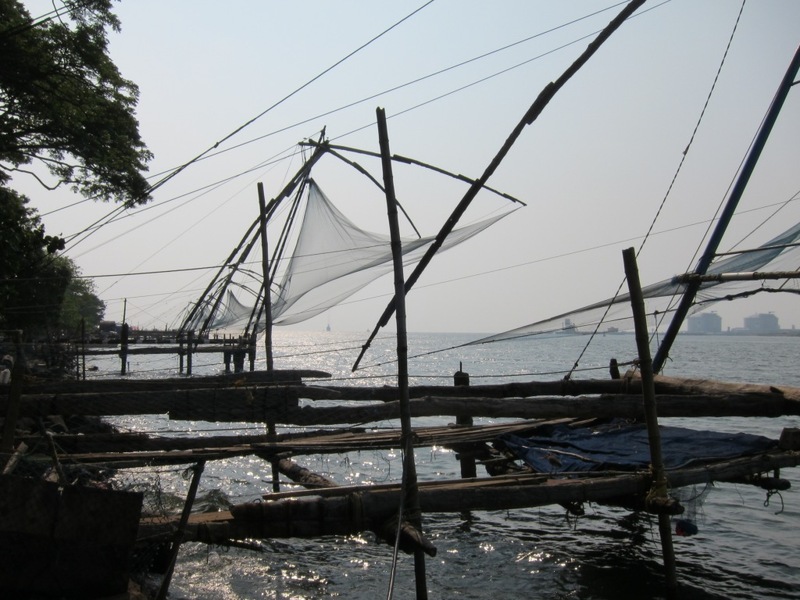 Perched on the end of a peninsula at the entrance to the harbour, Kochi was an important port in the spice trade of the 16th century, as Europeans outdid one another to import spices from Asia to Europe. 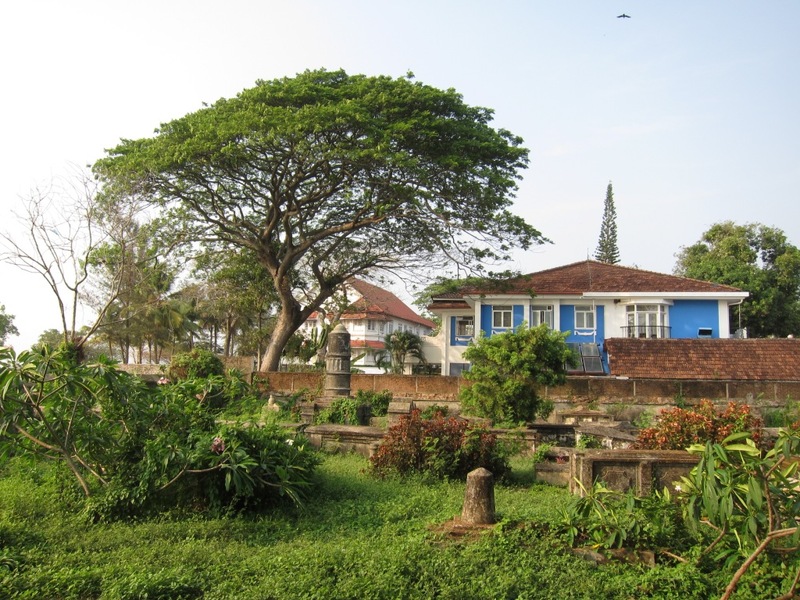 Originally occupied by the Portuguese, Kochi was the first European colony in India, and was later taken over by the Dutch, and eventually the British. As a princely state, Kochi was not officially part of India when it achieved independence in 1947, but joined willingly shortly thereafter. 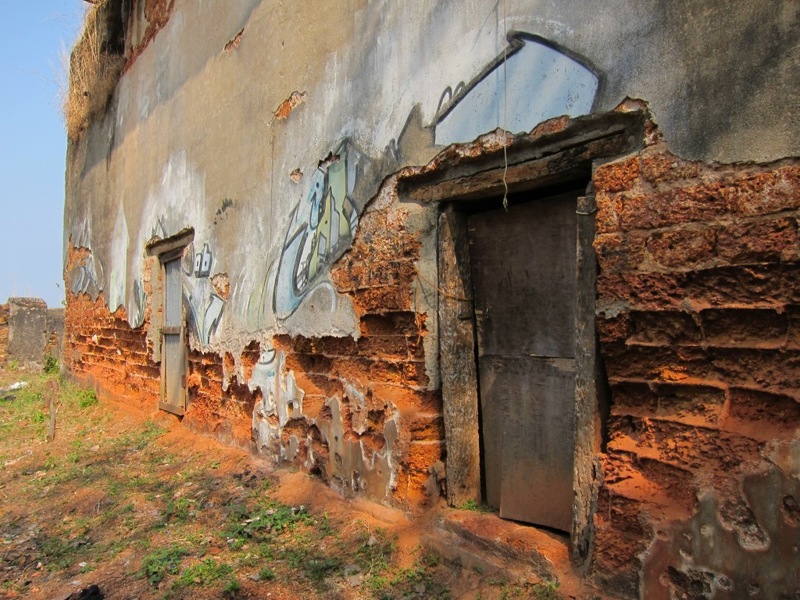 The historic part of Kochi is a centered around the old fort, and is overflowing with colonial-era buildings. 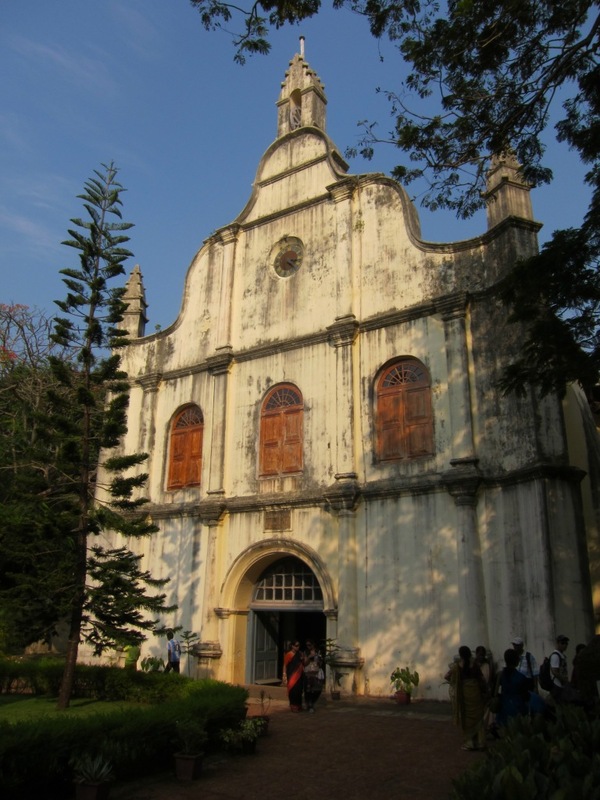 Of note is St. Francis Church, which was first built in 1503 and then rebuilt a dozen years later, making it one of the oldest churches built by Europeans in India. 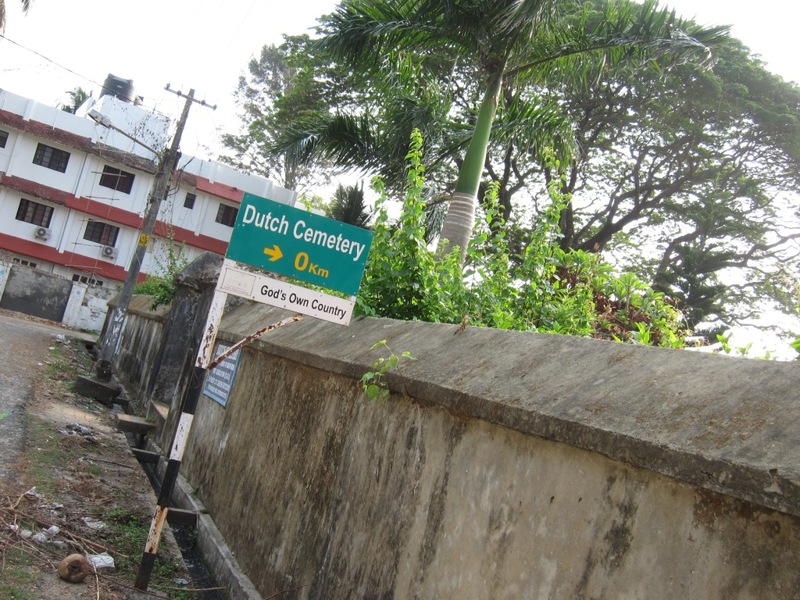 Other famous sites around town include the so-called “Chinese fishing nets” (which may actually have been introduced by the Portuguese), and the old Dutch Cemetery, pictured below. (The town is also filled with helpful signage). 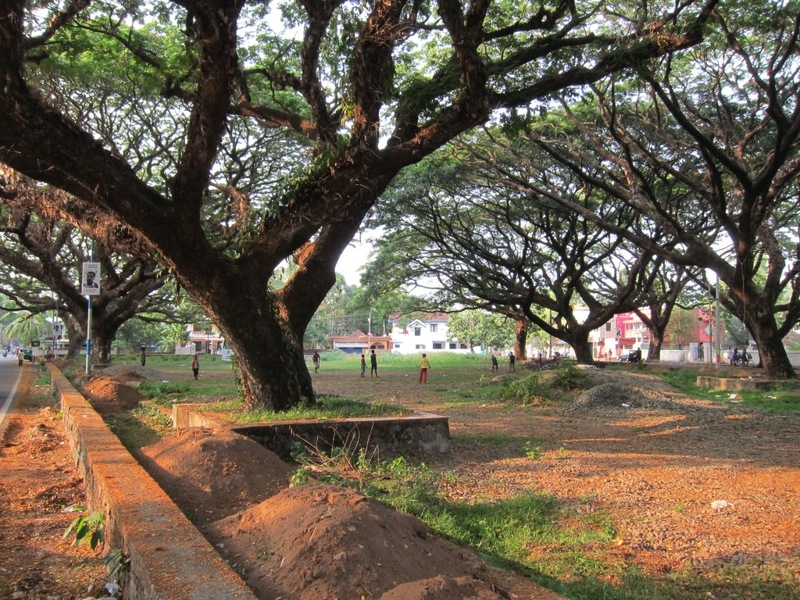 Present day Kochi has to be the most laid back city that I have been to in India, with a minimum of traffic, noise, and hassle (although this does not apply to the mainland part, known as Enrakulam, which is much like any other mid-sized India city). The most touristy parts of it do exhibit some of the usual encumbrances of rickshaws and souvenir stalls, but less so than elsewhere. Moreover, one only needs to walk a few blocks away from the tour-bus destinations to find a whole city of calm, tree-lined boulevards, inviting alleyways, and fascinating architecture. 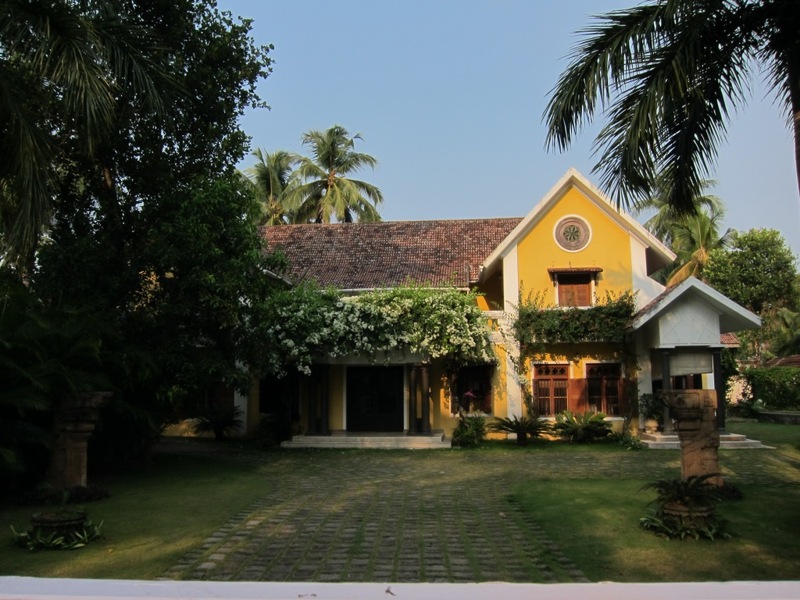 Parts of Kochi, especially around the old Fort, have been lovingly restored, with lots of hotel boutiquery. In other places new buildings mix modern and traditional styles, with rather mixed results. 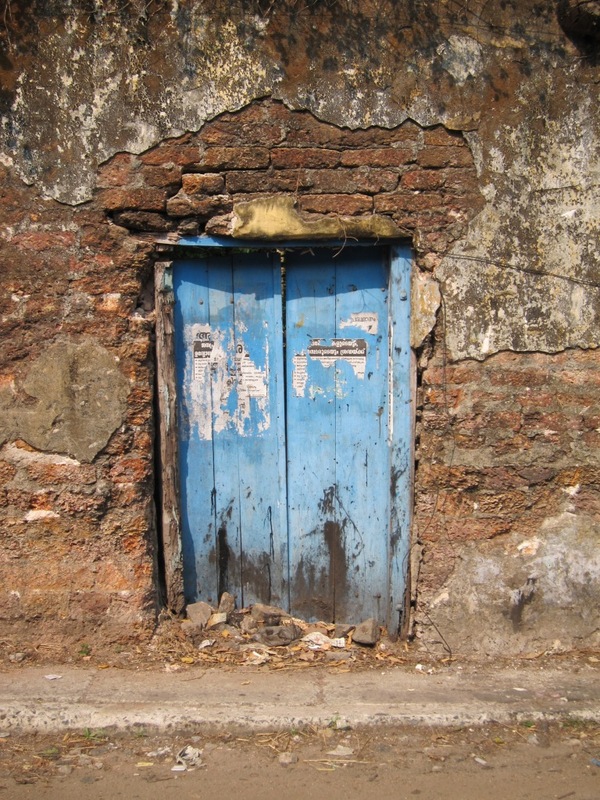 And yet more areas are even more delightfully dilapidated that Kolkata. 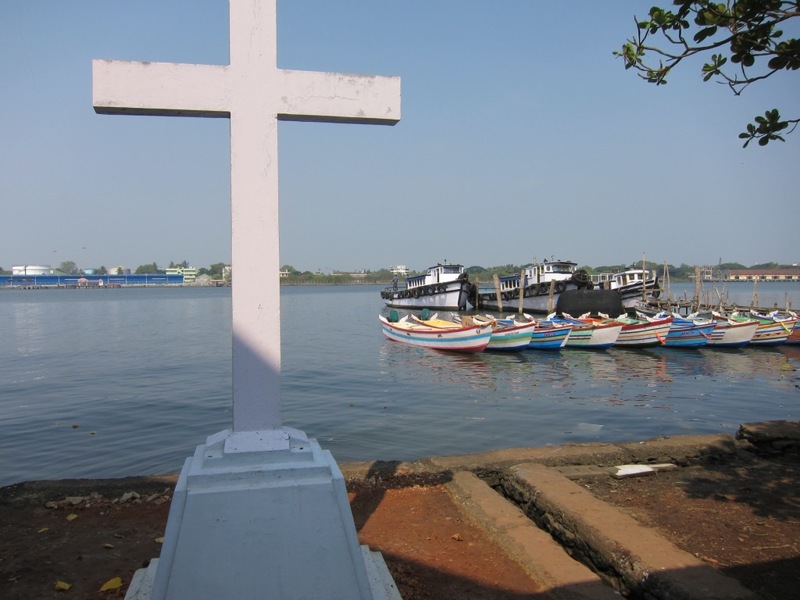 In terms of religion, Kochi has one of the highest proportions of Christians of any city in India. 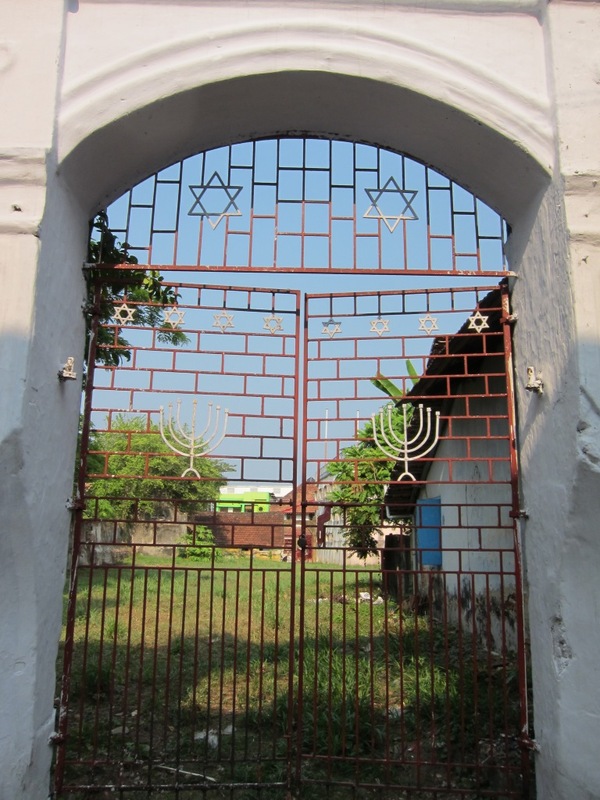 There is also a tiny Jewish population, the remnants of a once thriving community, most of whom have by now emigrated to Israel. 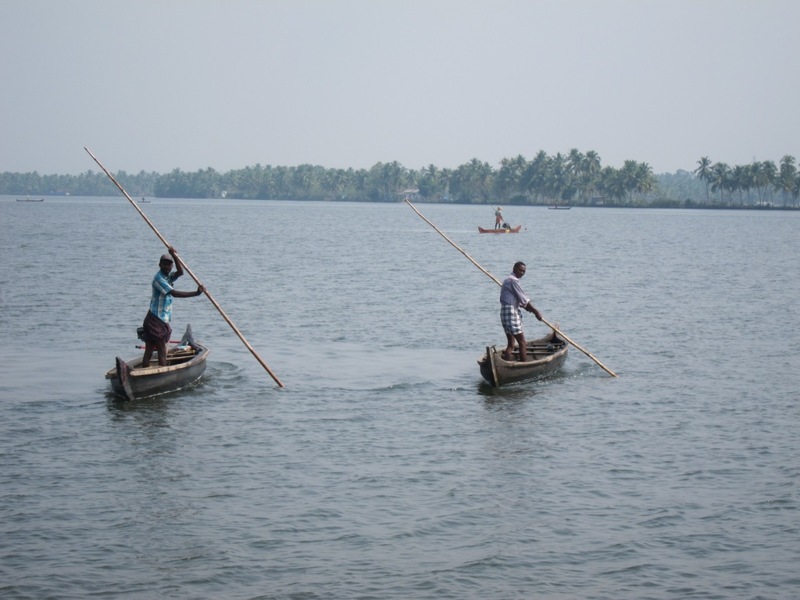 While the spice trade is not what it used to be (even the local Pepper Exchange, the world’s oldest, closed down a couple of years ago), Kochi remains a major port in Kerala and is well positioned to explore the inland waterways. 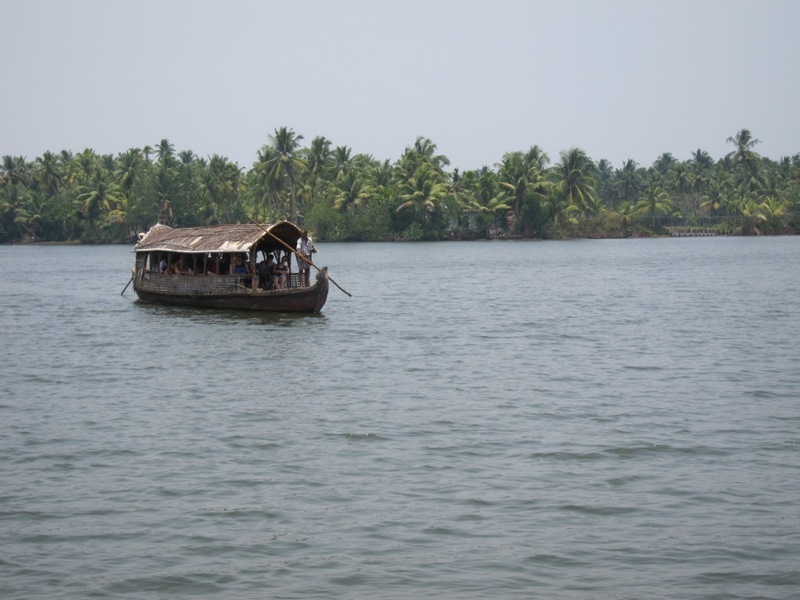 As a day trip from Kochi, I did a one-day tour of part of Kerala’s famous backwaters – a series of rivers and canals where water flowing from the hills around Munnar meet the salt water of the ocean. It was a bit touristy, but quite relaxing, and an interesting glimpse into traditional ways of life. There were about ten of us on board, including Americans, Europeans, a family from Bangalore, and a couple from Sri Lanka now living in Norway. In the morning we traveled in a mid-sized motor-powered canoe, much like the one in the photo below, passing quiet islands and local fishermen harvesting mussels directly from the ocean floor. We also stopped off at a former factory where mussel shells were roasted in order to produce calcium carbonate, which was traditionally used for many purposes. At the same location we were able to see all the major spice plants growing, including pepper, nutmeg, cocoa, vanilla, and cinnamon. It was incredible how fragrant the leaves of the cinnamon tree were, despite the fact that the spice is actually made from the bark. 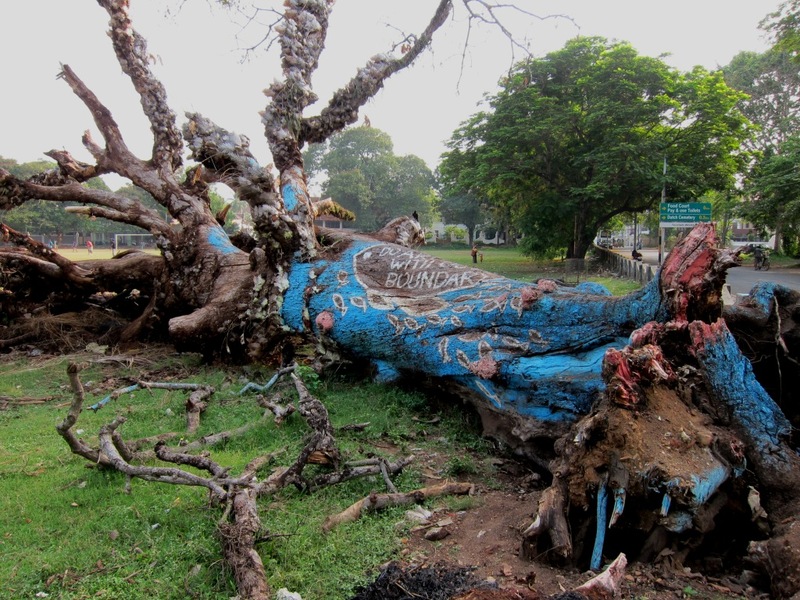 More importantly, we got to see “toddy tapping” an important job carried out by licensed state officials, who climb up coconut trees to extract the sap from the coconut flowers, which is later distilled into a potent alcohol. Supposedly, even straight out of the tree the toddy is slightly spirituous, although that was hard to verify from the sample we got to try. It’s probably slightly more accurate to say that the sap contains natural yeasts, and begins fermenting once it’s been extracted. In the afternoon, we hopped into a smaller canoe and paddled up a much smaller canal through the mangroves. 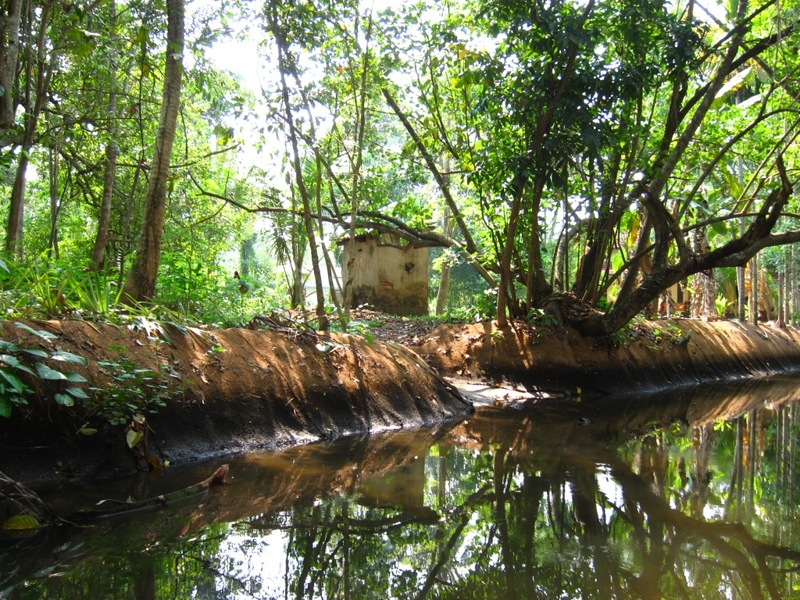 We later found out that the surrounding properties are all now fully connected by road, but these canals would once have been used for transportation, and similar infrastructure which is still active likely still exists in other parts of the state. 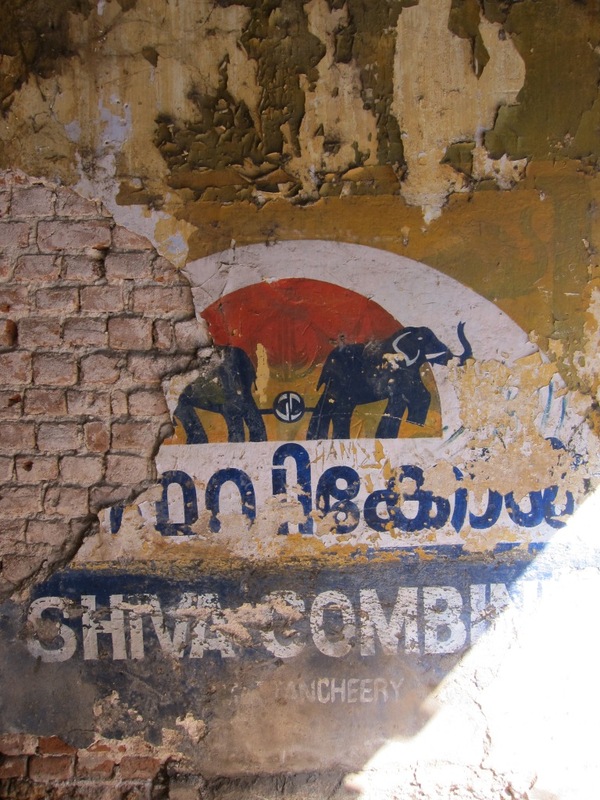 Back in Kochi, I continued to explore the town. 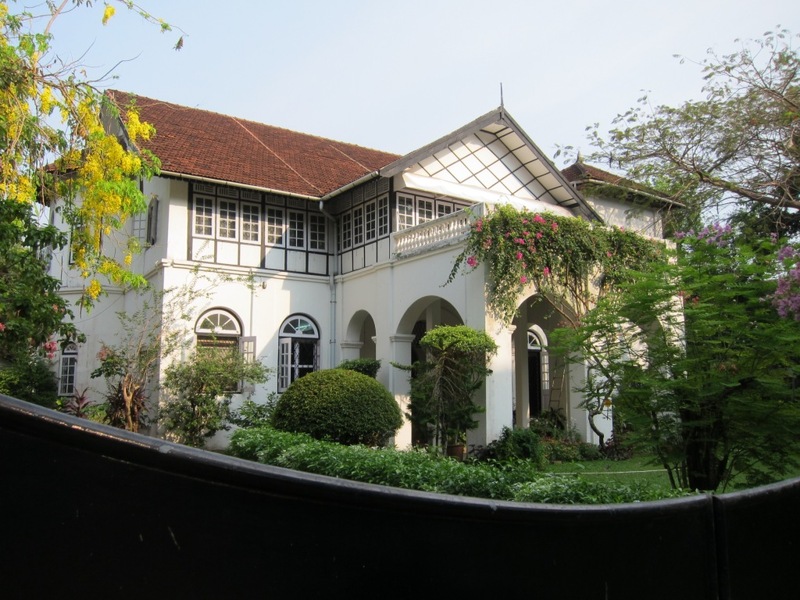 A delightful part of it was a thriving arts scene (accompanied by a thriving coffee culture, of course), one much more accessible to tourists than in Calcutta. In addition to plentiful galleries, there were obvious signs of independent artists at work, even in forms such as graffiti. (The tree below says “DO ART WITHOUT BOUNDARY”). While in Kochi, I also went to see a Kathakali performance, a traditional form of theatre based on Hindu religious texts, where actors use a rigid set of symbolic hand gestures and facial expressions, combined with full-body dance-like movements, to communicate to the audience and tell a story. Elaborate costumes and full face paint (made from flowers and ground-stone mixed with coconut oil) help the audience to distinguish the evil characters from the good. The presentation I saw was obviously intended exclusively for tourists, but that was actually quite helpful, as the story would have been fairly incomprehensible without their introduction. It also included a bit of a meta-theatrical component, as the actors helped to prepare each others’ make up on stage before the show. Although the performance was wordless, the power of it was based in movement and sound. The performers were joined on stage by two drummers and a singer, and even used their own bodies and the stage floor to generate sound. I wouldn’t say I fully understood the Kathakali language by the end of the evening, but I could certainly feel the drama as Bhima (with some help from Krishna), slayed Dussasana, pulled out his entrails, and ate them. In some ways, Kathakali is representative of so many art forms today. 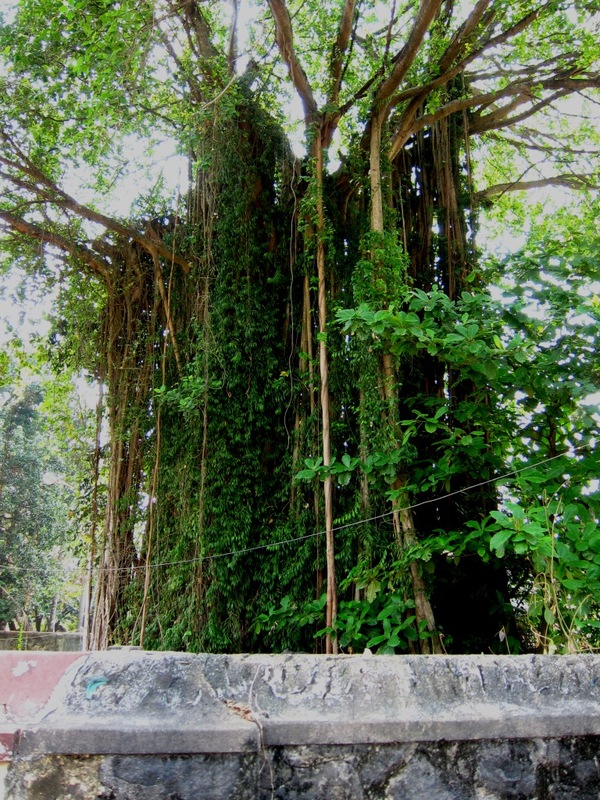 There is obviously a rich history of traditions behind it, and it even gets some press in the Keralan newspapers, but it is rather inscrutable to an audience unfamiliar with the form and the stories, and it no doubt has a hard time competing with the sheer entertainment power of Bollywood. The actors at the performance I saw had all spent many years training in this form, but I doubt if anyone in the audience would have been able to appreciate the difference between an amateur and a virtuoso. 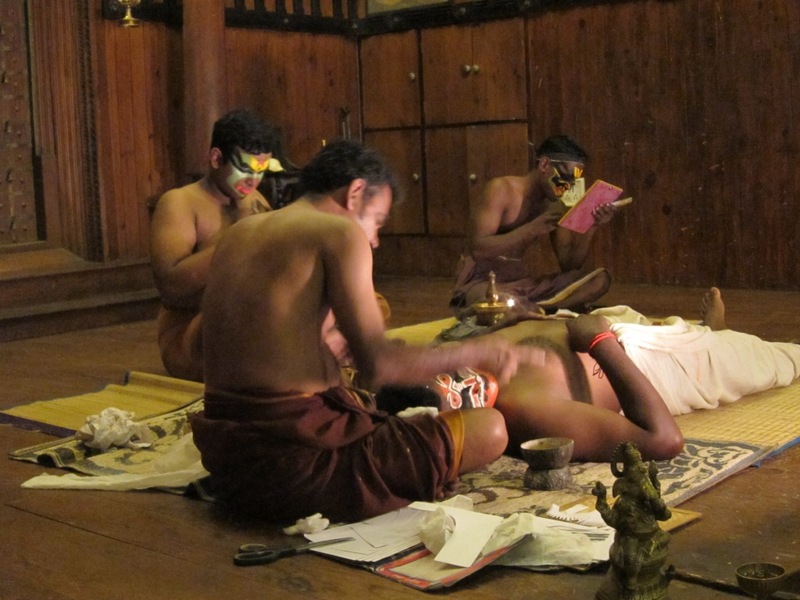 Finally, it bears mentioning that the other big tourism draw in Kerala is Ayurvedic “medicine”, a form of traditional therapy which apparently combines massage, special diets, purging, and so on. You can probably guess that I’m rather skeptical, but I’ll leave it to my friends at the Reality Check to investigate further. 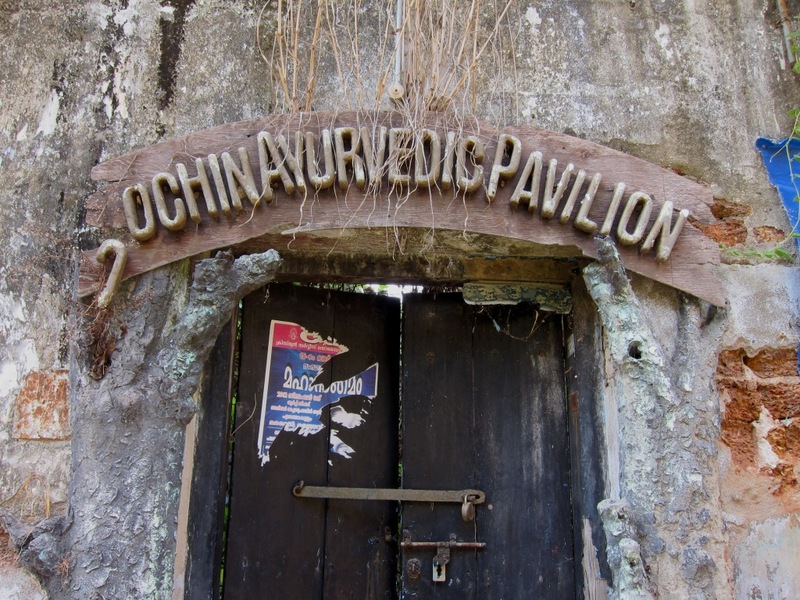 In any event, I met several people who had come to Kerala largely or in part to seek out Ayurvedic treatment for various ailments. Based on this building I found, it’s clearly been drawing people for quite a long time. 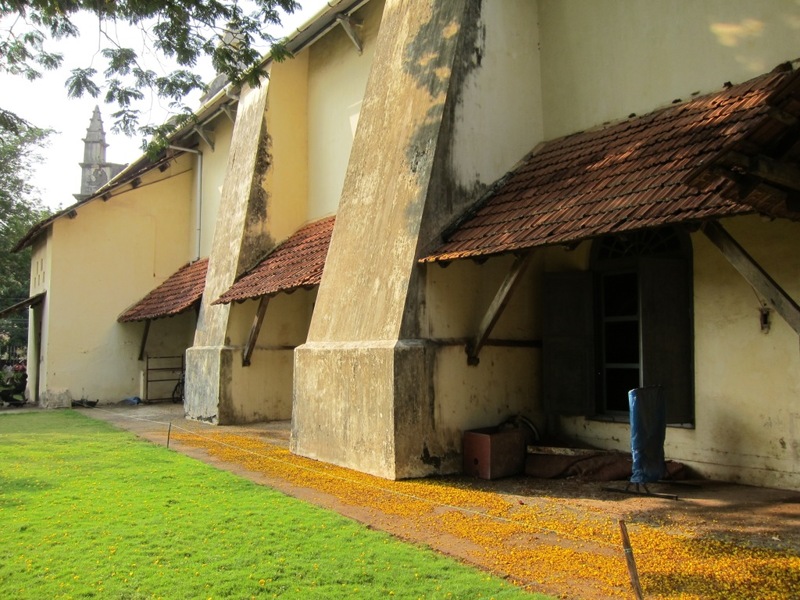 This entry was tagged architecture, art, backwaters, kathakali, spice trade, toddy. Bookmark the permalink. Love the images, especially Art Without Boundry. Think you may be in a competition with your cousin for stunning images! Thanks. IMG4137 is my new computer background. 🙂 How beautiful!!! It reminds me of a cottage at the lake, with the addition of palms, etc. Also, I really enjoyed hearing the music from the Arts Pavilion and replayed it several times while I ate my lunch here at work of homemade butter chicken, peas, basmati rice and store bought nan bread . Soooo interesting. You should have tried the medicine…for some little ache or pain. Probably not worth the $, eh?